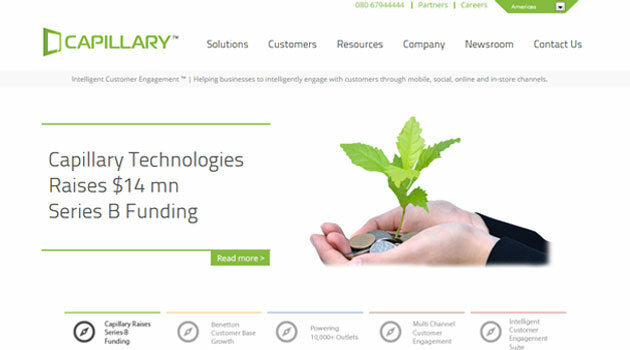 Bangalore-based Capillary Technologies Pvt Ltd, a SaaS-based CRM solutions provider, has raised $14 million in its Series B round of funding led by existing investors Sequoia Capital and Norwest Venture Partners (NVP). The funds will be used to enhance the firm's cloud-based integrated marketing platform and grow its partnership ecosystem, the company said in a press release. The latest round of funding comes barely five months after the firm netted $4.5 million in funding from American Express Ventures. This was preceded by a $17 million in its Series A round of funding from Sequoia, NVP and Qualcomm Ventures in 2012. Capillary was set up in August 2008 by IIT Kharagpur alumni Reddy, Krishna Mehra and Ajay Modani. It is into cloud-based software solutions that help retailers engage with customers through mobile, social and in-store channels. The firm claims that its integrated marketing platform helps retailers easily manage their customer data, gain insights and personalise engagement across multiple channels. The company caters primarily to the clients in the retail market with 40 per cent revenues coming from apparel, fashion and shoes; 30 per cent from food retail; 20 per cent from white goods and electronics and remaining 10 per cent from pharmacies and hypermarkets which is a relatively new segment and is growing. Capillary's platform powers more than 150 major brands across 10,000 retail locations. Its clients include Pizza Hut, Benetton, KFC, Puma, Marks & Spencer and Lacoste. "Retailers realise a 15 per cent increase in average basket value and 30 per cent increase in their customer retention rate by implementing our solutions, which is the reason we continue to grow so rapidly around the world," said Aneesh Reddy, co-founder and CEO of Capillary.